I’m Going to Grow My Own Saffron! I admit it, I’m a huge lover of paella, that wonderful Spanish rice and seafood and whatever-else-you-want-to-add dish! The only drawback is that for a truly tasty pan of paella, one must use the most expensive spice in the world…saffron. 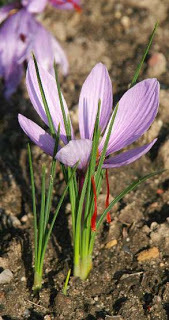 It’s made from the tiny filament in the center of a specific crocus flower and must be harvested in the fall using a pair of tweezers! The incredibly wonderful news is that I found a source for the bulbs of the saffron crocus! It’s a web site for the Rosemary House. I just ordered a bunch of bulbs and apparently, this is the perfect time of year to plant them. so next fall, about this time, I should be able to harvest my own saffron. So if you like dishes that use saffron, you have a choice of substituting turmeric (not perfect, but it’ll do in a pinch) or you can grow and harvest your own saffron!